Magnetic resonance imaging (MRI) is a modern and very thorough procedure which allows to view sections of human internal organs in all dimensions. The scan is possible thanks to the magnetic properties of atoms of which the human body is built of. A strong magnetic field, pulses of short radio waves and a PC which transforms the obtained data into images are necessary to perform the procedure. 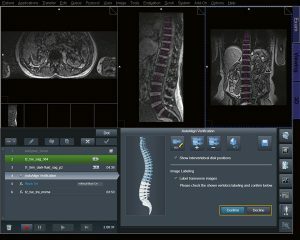 The scan provides a non-invasive method for seeing the human internal organs and for evaluating the condition of each of the organs. The main advantage of an MRI is its safety for the patient. In contrast to a CT, an MRI does not require the use of x-ray. It is commonly believed that an MRI is a non-invasive procedure that does not strain the patient. We use in our laboratory 3 tesla apparatus.